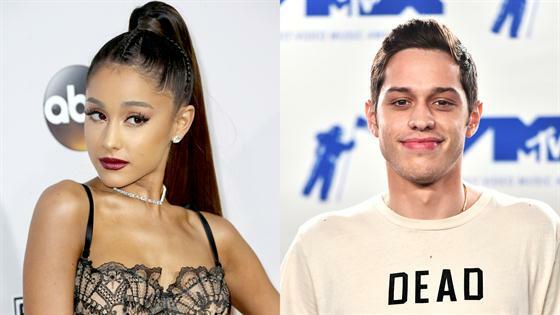 Ariana Grande and Pete Davidson's Notorious P.I.G. made a lengthy Internet debut in the singer's music video for her song "breathin." Their pet teacup pig, aptly named Piggy Smalls, wandered around a bed while occasionally sniffing at the camera for a little over three minutes. That's the entirely of the music video. Piggy Smalls has appeared on Grande's Instagram from time to time, but "breathin" is the animal's first major commercial move. On Sept. 16, Grande introduced Piggy to the world in an Instagram story in which her pet sits on her shoulder. In another photo, the piglet sleeps on Davidson's stomach with a subtle grin on its face. While the "No Tears Left to Cry" singer put Piggy in her video, the Saturday Night Live cast member made their newest addition to the family a bit more permanent. He got Piggy Smalls' name tattooed on his torso as well as a drawing of their pet. A few weeks after he got inked, Davidson went on Late Night With Seth Meyers and delved into some more details about Piggy and how he came to inhabit their $16 million New York City apartment. He told Meyers, "This girl, like, she was like, 'I want a pig.' And then an hour later it was just there. You know what I mean?" He continued, "Like, I'm still trying, to get, like, a Propecia refill….This chick got a pig in a f--king hour." According to Davidson, Piggy might not be so Smalls anymore. He said their pet was "big now." The SNL comedian admitted, "I love it.I want it to get big and fat." On Friday, Grande posted a selfie on Instagram with her album Sweetener and while fans enjoyed that, there was something perplexing in the background that made fans curious. It was a crib with a lamp clipped onto it. Even Katy Perry was confused. "What are you cooking in the crib," the "Roar" singer commented. More fans started asking the same question. Grande replied, "My secret child duh." Presumably not wanting the rumor mill to start flooding, she clarified the reason behind the crib. "That's Piggy Smalls' play pen in the background. The red is to keep him warm," she answered. On Tuesday, Grande posted a montage on Instagram of the two of them snuggling as well as solo shots of the pig just being its cute self. Grande teased Piggy's "breathin" appearance in one of her Instagram uploads. She posted a clip of the music video with Piggy munching on something and navigating the blanket it's standing on. "u asked," she captioned it. Ask and you shall receive Piggy Smalls. Watch the full video for "breathin" above.